Happy Father’s Day! 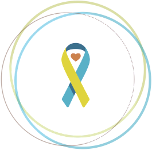 I was recently asked to describe in a single word what it is like to be the Dad of a child who has Down syndrome. I had never thought about it before. Truthfully, I couldn’t do it. Perhaps for the first time in my life, I was speechless and had nothing to say. The reality is there were so many adjectives that came to mind and each word battled to make it out of my mouth before the other. I soon gave up and told the person I could not summarize this adventure in a single word and it was a fruitless endeavor to even try. 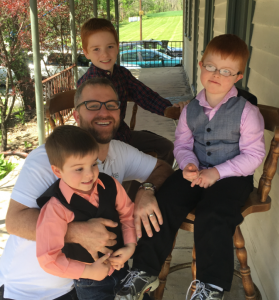 There are many words to describe being a Dad to someone who has Down syndrome and since it is Father’s Day, it seems appropriate to reminisce over a few of them and how they have impacted who I am as a person, and ultimately as a Dad. Our son Jack (you can read more about Jack at www.jacksdad.org) is now 7 years old and has just finished 1st grade. I can’t believe it. It seems like just yesterday he was born. When Jack was born and we learned he had Down syndrome, I was scared. The fear of the unknown medical details was initially paralyzing. Fact sheet after informational white paper seemed to have words on it I never knew existed. I studied Greek in college for half a semester and that was no help at all. Being a Dad to a child with Down syndrome is scary. It is scary because each day is a day Jack could have a difficult day at school, perhaps run away (which he is good at) or struggle to communicate or something even worse. You develop a sixth sense of looking around each corner to evaluate social settings, playgrounds and such. As time goes on and Jack grows more and more, being Jack’s Dad is educational. All those words I had no clue about when he was born…I actually know what they mean now. I can somewhat keep up in conversation with cardiologists, pulmonologists and other medical ‘gists’. I’m just a farm boy from the middle of nowhere in rural Australia… it was a steep learning curve. But as Dad, I am still learning. Once school age comes, you learn schools have more acronyms than the government…and they throw them around like nobody’s business. That’s an education! Jack has also educated me. He has taught me that above all being a Dad is not about ‘doing’ my responsibilities, but rather ‘being’ Dad. Not only was that an education, it was a stress relief. Jack doesn’t want a dad who constantly keeps up programs and entertainment. He desires a Dad who will lay in his bed at night to help him calm and control his body movements. Jack longs for a Dad who will sit and take the time to have a conversation over a ‘cup of tea’ and a Dad who will let him drive the tractor (more on that in another story). 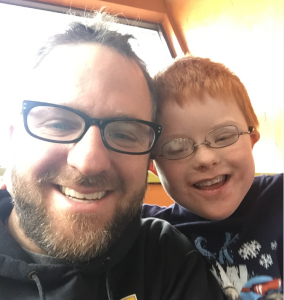 Being a Dad to a child with Down syndrome also requires patience and the need to be genuine. Not a lot can be done when Jack shuts down and flops to the floor in the middle of a store or public place. You can’t get upset or frustrated because it doesn’t do anything positive. Learning this patience leads to a genuine outlook that no longer sees the world for its flashy toys and shallow desires, rather it shapes a worldview which believes people are the most important element on this earth. People come in all shapes, sizes, personalities. Some even have disabilities. Learning and internalizing a genuine attitude towards life also shines a light on our own shortcomings and helps us realize we are actually more alike than different. Subsequently, we treat people according to life’s golden rule, to do unto others as your would have them do unto you. Now it’s time to truly confess. Being a Dad to a child with Down syndrome also makes me angry. Not angry towards Jack. But there are times when we are in deep conversation and he is trying so hard to tell me what’s on his mind. He gets frustrated and it all breaks down. Have you been there? Or the times when we sit at the table to work on his homework and he wants to write his numbers, but is unable to get his hand to move in the appropriate way. All the encouragement in the world cannot take away the fact that the extra chromosome is a hindrance to the growth Jack so greatly desires. I see it in his eyes and it makes me angry. There are so many other emotions we experience on a daily basis. As a Dad, I’m sure you can relate. Even amidst all these emotions, being a Dad to a child who has Down syndrome is fulfilling. It is fulfilling to know Jack does have wants and tries to achieve them. It is fulfilling to see Jack’s brothers look out for him and help him. It is amazingly fulfilling to be Jack’s Dad, who receives so much love and affection from Jack. There is no one else on this earth who makes Jack happier than me, his Dad. When Jack’s world crumbles … I am able to calm him … sometimes I am the only one. To know Jack loves his Dad that much is very fulfilling. No one told me being a Dad would be easy; they never even said it would be difficult. But getting the privilege of being a Dad to child with Down syndrome is both, and the great part is that we get to celebrate both the easy and difficult moments together. You can read more at www.jacksdad.org, Twitter @jacksdadblog or on Facebook at www.facebook.com/jacksdadblog.